I’ve wanted to revisit the type after Small. This design is a little larger. Small could be built at 13′ or 14′. This design can be built from 14′ – 6″ to sixteen feet – LWL. The plans are hand-drawn. The boat will have to be lofted, but there are full-sized patterns for the stem & transom and the centerboard & rudder. I would recommend that you build a model first. You can either do a half model, using the waterlines from the Lines Plan to make lifts, or, make a scale version of the strong back and molds set-up you will need to work out. This can be done using balsa “scantlings” available at hobby and architect/art supplies stores, or even just using card. I recommend getting a copy of this book: John Leather’s Clinker Boatbuilding. and also this one: Eric McKee’s Clinch Lap and Clinker. 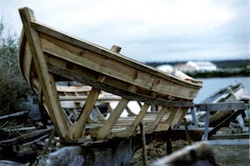 The latter has a card model you can build that really is a great primer in getting hands-on with planking a boat! The key is for you to find ways to internalize the process. 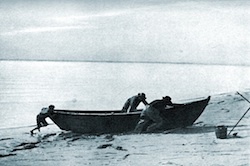 Building a boat isn’t a question of following a recipe. The challenge and opportunity is to develop a way to think your way through the process. Print out reduced prints scaled to fit on a page of letter or legal paper to begin familiarizing yourself with the design. Then for model-making you can have 100% prints on Bond paper to cut-up and use as templates for the lifts – half-model, and molds – for the planked hull. The half-model will get the hull form into your brain. The set-up model will let you rehearse all the steps in getting the strong back, molds and backbone established. You don’t have to take the model too far or get too precious over it, but it will bring you much more confidence when you get into the shop in the Fall.